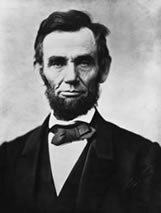 Abraham Lincoln research papers overview the famous President and his stance on slavery, Christianity and even Shakespeare's tragedies. Abraham Lincoln (1809-1865) possessed a philosophy that remains a controversial and elusive Abraham Lincoln for many people. The interest in Lincoln’s philosophy exist because he was a man that appeared to be of great and strong moral conviction and was also a man of great accomplishments and mystery. And finally, Lincoln’s philosophy remains to many, an enigma, in that he made it a point to guard his true beliefs, while at the same time, possessing a way with words concerning philosophical and ethical matters that left one with something of a riddle. Some argue that Lincoln’s philosophy was fatalism. However, his life during the Presidency years indicate that his philosophy evolved from fatalism into determinism. Lincoln’s philosophy was unlike many in his day in that he did not hinge it around conventional Christianity. Although he read much and loved debates, plays, and the ideas of others, he remained a man who liked to think for himself. In part, Lincoln’s philosophy was a direct product of his background. The fact that “... Lincoln grew up in a poor dirt-farming family in the upper South and lower Midwest without privilege, position, or much formal education” in an era where people lived off the land, must have molded his early ideology to a great deal. For Lincoln’s contemporaries, death was a reality that often came suddenly and early. Combine the mind-set that came with reality on the American frontier with a life-long deep passion for William Shakespeare’s tragedies, and one might safely subscribe Lincoln to the closely related philosophies of fatalism or determinism. What makes Lincoln a great historical figure is history’s portrayal of him accomplishing things against the odds. Though Lincoln had no formal education and did not come from a family that was affluent in any regard, Lincoln educated himself and became a distinguished lawyer, a member of the Illinois State legislator, then Congressman, and finally President. One with a purely fatalistic philosophy would have concluded all is vanity and not fought the odds as well as Lincoln did. To what extent were these causes addressed and resolved by the War and Reconstruction? You should assume that at least some of these causes were not thoroughly addressed and resolved. Investigate Abraham Lincoln's intense need to be involved in tactical decisions when it came to the Battles in the Civil War. Early on in the war, many Union Generals weren't too happy with him being involved, but Lincoln insisted. Abraham Lincoln and the Civil War term papers report on the abolitionists and how Lincoln planned to handle the possibility of war. Order a research paper on Abraham Lincoln and the Civil War from Paper Masters. Killing Lincoln: The Shocking Assassination research papers examine John Wilkes Booth, the man who shot Lincoln. Lincoln and Douglas research paper analyzes the debate between the two presidential candidates on slavery. Gore Vidal's Lincoln in a unique look at Abraham Lincoln's presidency during the time of the Civil War. Secession Theory - The South also resented the election of President Abraham Lincoln, who publicly stated he wanted to abolish slavery once and for all. The Battle of Chickamauga - Under unity of command, Union Major General William S. Rosecrans, first established the Mass of a decisive place and time in which to strike the Confederate army. Pickett's Charge - The battle is named for Major General George Pickett, the lead assault commander of three forces that were to attempt to gain ground against the Union. Paper Masters writes custom research papers on Abraham Lincoln and overview the famous President and his stance on slavery, Christianity and even Shakespeare's tragedies.